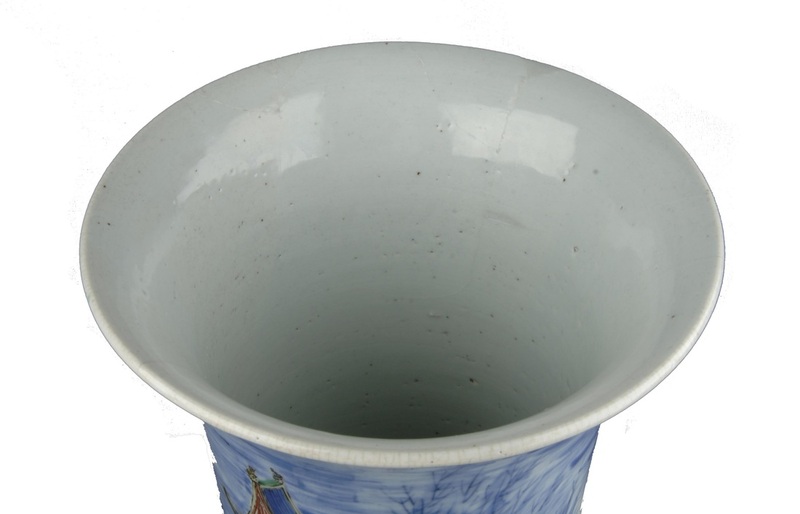 Beaker shaped vase in Wu Tsai enamels. On the top funnel shaped register, five immortals in a punt , fishing for their hand maid, abducted by the dragon king; the palace of the dragon king with pink terrace walls enclosing plantains & the three friend's hosu boat moored beside it. 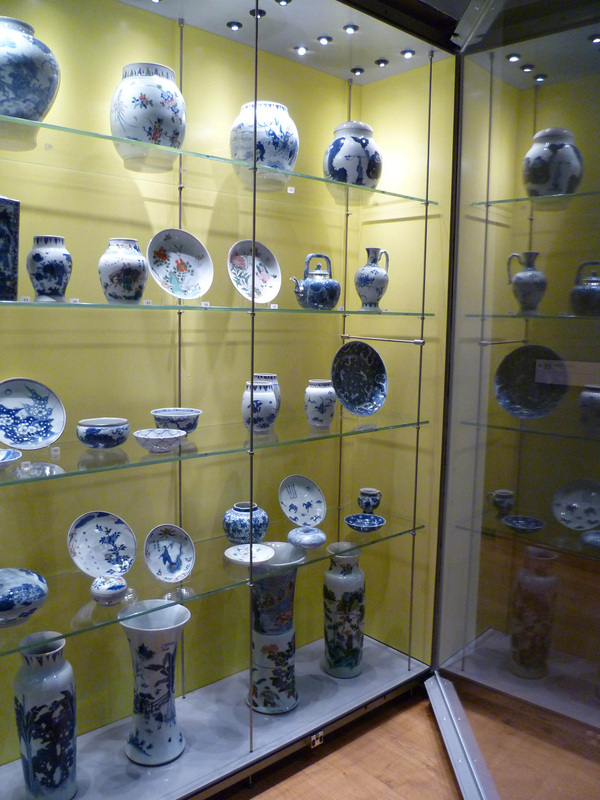 The object was made in China in 1640 – 1660. 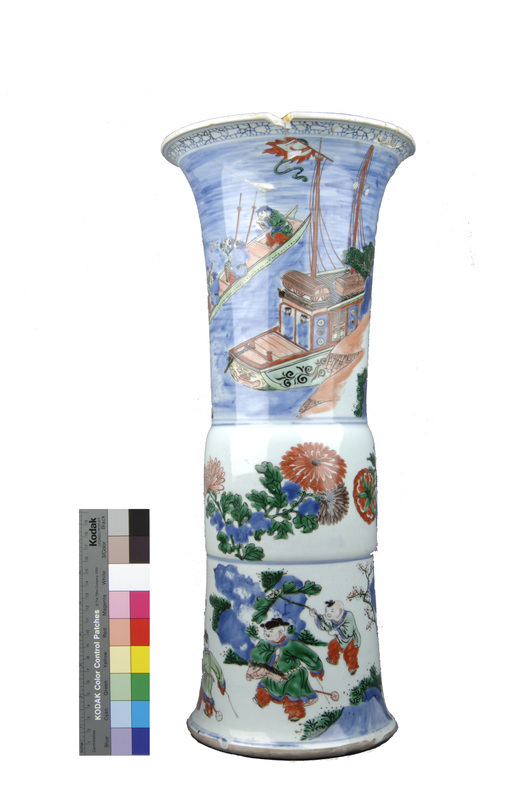 It was purchased by Gerald Reitlinger some time in the 20th century and formed part of his immense ceramic collection from Islamic lands and the Far East (Bullock 1981). On his death in 1978, Reitlinger gifted his entire collection to the Ashmolean Museum. 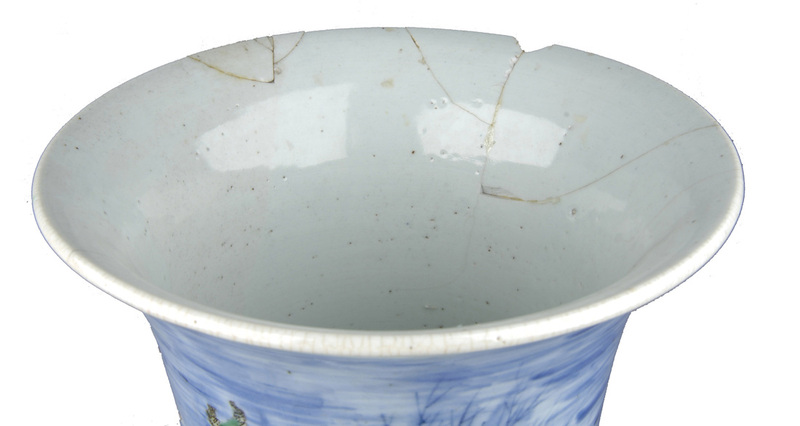 The body of the ceramic was in very good condition, but there were breaks around the rim that had previously been repaired. Six sherds had been re-adhered to the rim using an adhesive, to excess in some areas, that had become yellowed and unsightly (see below). Clearly not all of the fragments were recovered, as there was a significant gap missing from the rim and some of the exterior surface ws missing from around the re-adhered pieces. 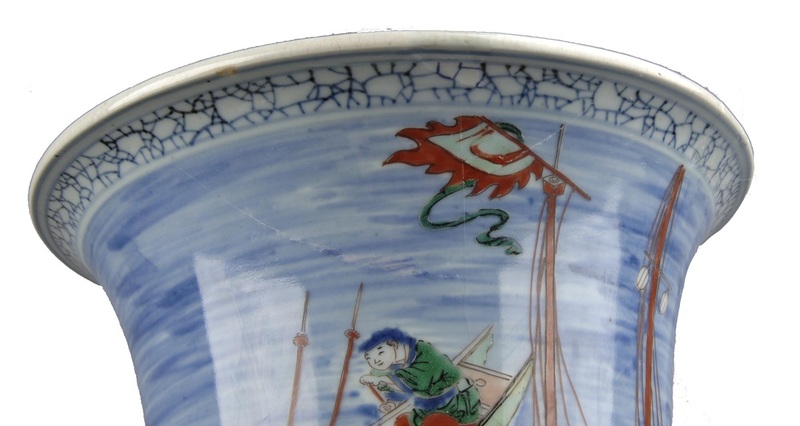 There are also three vertical hairline cracks from the rim, one above the pagoda, 8cm long, one above the front of the punt, 5cm long, and the other above the waterfall, 1.2cm long. There is also a crack running 3cm down from the bottom-most point of the largest sherd. The previously adhered sherds at the rim were removed by creating a local atmosphere of acetone, which removed the largest sherds, followed by dichloromethane, which removed the rest of the sherds. The edges of the sherds were cleaned using acetone and hand tools. 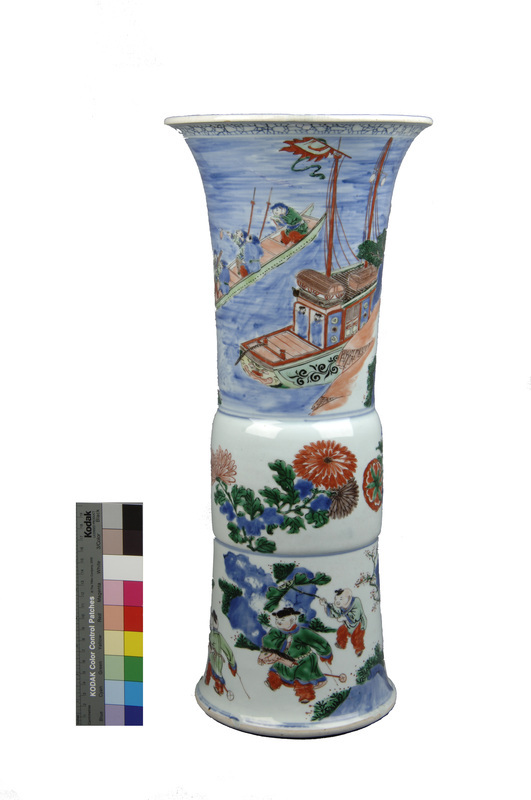 All sections of the vase were soaked in tap water for 24 hours, then Bio-tex and Calgon for 24 hours. All pieces were then brushed and rinsed, and soaked again in fresh water. After soaking, hydrogen peroxide (6% or 20 vol.) plus a few drops of ammonia (as catalyst) were applied via cotton wool to the hairline cracks on the inside of the ceramic. This was refreshed several times until the cracks were seen to lighten. Sherds were re-adhered with 50% w/v Paraloid B72 (an ethyl methacrylate copolymer) in acetone. Losses were filled with Fynebond (a 2 part epoxy resin) bulked with fumed silica and coloured with dry pigments and Lascaux acrylic paints. Lascaux gloss acrylic varnish and acrylic paint were used to create the “crackled” effect on the edge of fill at the rim. The appearance of the object was greatly improved, and it was able to be displayed. The joins are now completely concealed, and the porcelain presented as a whole piece, as expected of such objects, and by the curator.